President Obama was primarily referring to gun control in the portion of his speech addressing the cause of attacks like this. Not all mass shootings are racially motivated, and not all qualify as “terrorist” attacks—though Charleston certainly qualifies. And the mass shooting that occurred a just a month later in Chattanooga, Tennessee by a Kuwati-born American citizen was quickly labeled an act of domestic terrorism. But, President Obama makes an important point here: mass shootings are a distinctly American problem. This type of rampage violence happens more in the United States of America than anywhere else (see here for a thorough analysis of international comparisons). And gun control is a significant part of the problem. But, gun control is only a partial explanation for mass shootings in the United States. Mass shootings are also almost universally committed by men. So, this is not just an American problem; it’s a problem related to American masculinity and to the ways American men use guns. But asking whether “guns” or “masculinity” is more of the problem misses the central point that separating the two might not be as simple as it sounds. And, as Mark Follman, Gavin Aronsen, and Deanna Pan note in the Mother Jones Guide to Mass Shootings in America, the problem is getting worse. We recently wrote a chapter summarizing the research on masculinity and mass shootings for Mindy Stombler and Amanda Jungels’ forthcoming volume, Focus on Social Problems: A Contemporary Reader (forthcoming, Oxford University Press). And we subsequently learned of a new dataset on mass shootings in the U.S. produced by the Stanford Geospatial Center. Their Mass Shootings in America database defines a “mass shooting” as an incident during which an active shooter shoots three or more people in a single episode. Some databases define mass shootings as involving 4 shootings in a single episode. And part of this reveals that the number is, in some ways, arbitrary. What is significant is that we can definitively say that mass shootings in the U.S. are on the rise, however they are defined. TheMother Jones database has shown that mass shootings have become more frequent over the past three decades. 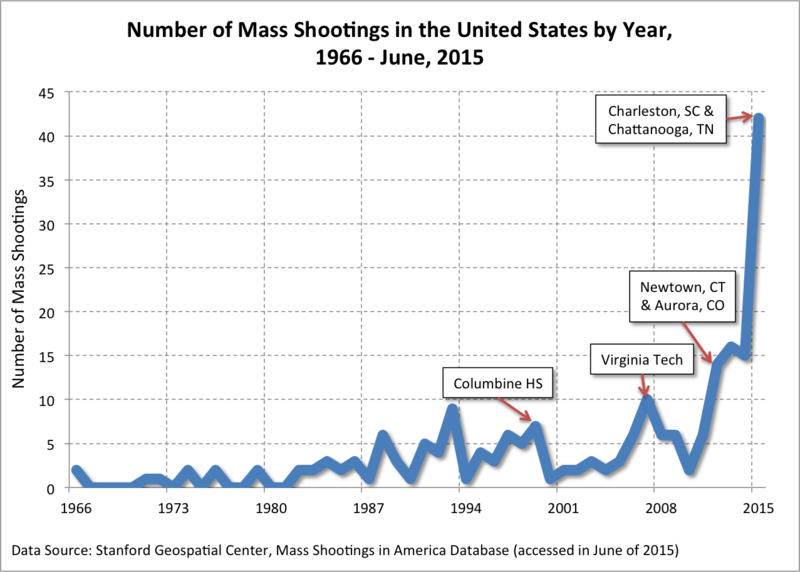 And, using the Stanford Mass Shootings in America database, we can see this trend here (below) by relying on data that stretches back a bit further. 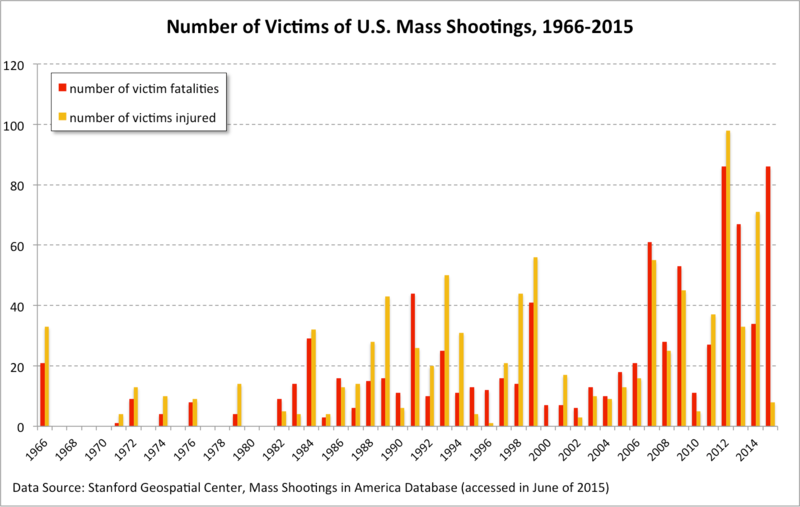 Additionally, we know that the number of victims of mass shootings is also at an historic high (below). We also produced a time-lapse map of mass shootings in the United States illustrating both where and when mass shootings have occurred using the Stanford Geospatial Center’s database to illustrate this trend over time (see below). Our map charts mass shootings with 3 or more victims over roughly 5 decades, since 1966. The dataset takes us through the Chattanooga, Tennessee shooting, which brought 2015 to 42 mass shootings (as of July). * The dataset is composed of 216 separate incidents only 5 of which were committed by lone woman shooters. Below we produced an interactive map depicting all of the mass shootings in the dataset with brief descriptions of the shootings. In our chapter in Stombler and Jungels’ forthcoming book, we cull existing research to answer two questions about mass shootings: (1) Why is it men who commit mass shootings? and (2) Why do American men commit mass shootings so much more than men anywhere else? Based on sociological research, we argue that there are two separate explanations–a social psychological explanation and a cultural explanation (see the book for much more detail on each). A Social Psychological Explanation–Research shows that when an identity someone cares about is called into question, they are likely to react by over-demonstrating qualities associated with that identity. As this relates to gender, some sociologists call this “masculinity threat.” And while mass shootings are not common, research suggests that mass shooters experience masculinity threats from their peers and, sometimes, simply from an inability to live up to societal expectations associated with masculinity (like holding down a steady job, being able to obtain sexual access to women’s bodies, etc. )–some certainly more toxic than others. The research on this topic is primarily experimental. Men who are brought into labs and have their masculinity experimentally “threatened” (see here for more details) react in patterned ways: they are more supportive of violence, less likely to identify sexual coercion, more likely to support statements about the inherent superiority of males, and more. This research provides important evidence of what men perceive as masculine in the first place (resources they rely on in a crisis) and a new kind evidence regarding the relationship of masculinity and violence. The research does not suggest that men are somehow inherently more violent than women. Rather, it suggests that men are likely to turn to violence when they perceive themselves to be otherwise unable to stake a claim to a masculine gender identity. A Cultural Explanation–But certainly boys and men experience all manner of gender identity threat in other societies. Why are American boys and men more likely to react with such extreme displays? To answer this question, we need an explanation that articulates the role that American culture plays in influencing boys and young men to turn to this kind of violence at rates higher than anywhere else in the world. This means we need to turn our attention away from the individual characteristics of the shooters themselves and to more carefully investigate the sociocultural contexts in which violent masculinities are produced and valorized. Men have historically benefited from a great deal of privilege–white, educated, middle and upper class, able-bodied, heterosexual men in particular. Social movements of all kinds have slowly chipped away at some of these privileges. So, while inequality is alive and well, men have also seen a gradual erosion of privileges that flowed more seamlessly to previous generations of men (white, heterosexual, class-privileged men in particular). Michael Kimmel suggests that these changes have produced a uniquely American gendered sentiment that he calls “aggrieved entitlement.” Of course, being pissed off about an inability to cash in on privileges previous generations of men received without question doesn’t always lead to mass shootings. But, from this cultural perspective, mass shootings can be understood as an extremely violent example of a more general issue regarding changes in relations between men and women and historical transformations in gender, race, and class inequality. Mass shootings are a pressing issue in the United States. And gun control is an important part of this problem. But, when we focus only on the guns, we sometimes gloss over an important fact: mass shootings are also enactments of masculinity. And they will continue to occur when this fact is combined with a sense among some men that male privilege is a birthright–and one that many feel unjustly denied. 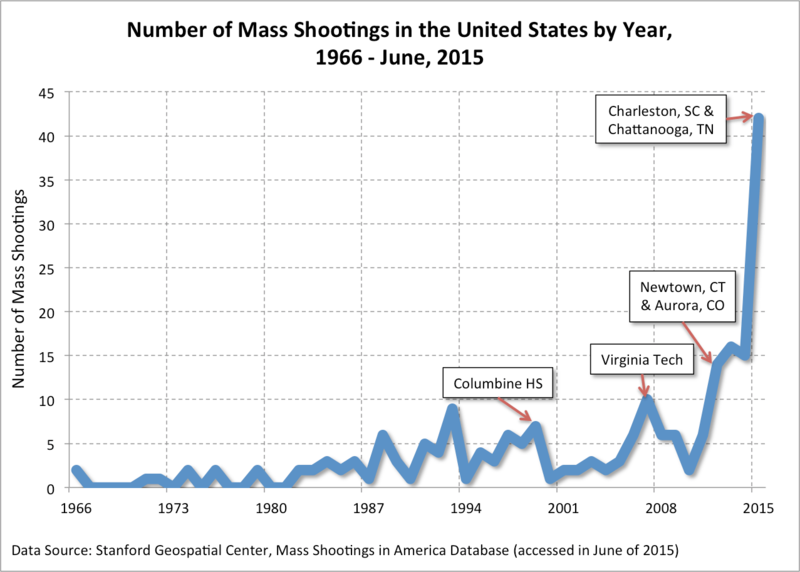 *The mass shootings in Charleston, South Carolina in June of 2015 and Chattanooga, Tennessee in July of 2015 were not in the dataset when we received it. The data ran through May of 2015. So, we’ve added the Charleston and Chattanooga shootings into the dataset for the graphs and maps on this post.